Dr. Sharma received her Doctorate of Dental Surgery from The Ohio State University in 2006, where she graduated top 10 in her class. She furthered her education with completing a three-year Prosthodontic residency at The Ohio State University where she was awarded a Masters of Science and Prosthodontic Certificate of Speciality. Having extensive training in laboratory procedures, broad knowledge of the dental materials and state-of-the-art techniques, she serves as an architect of treatment plan necessary to create beautiful and natural-looking smiles. 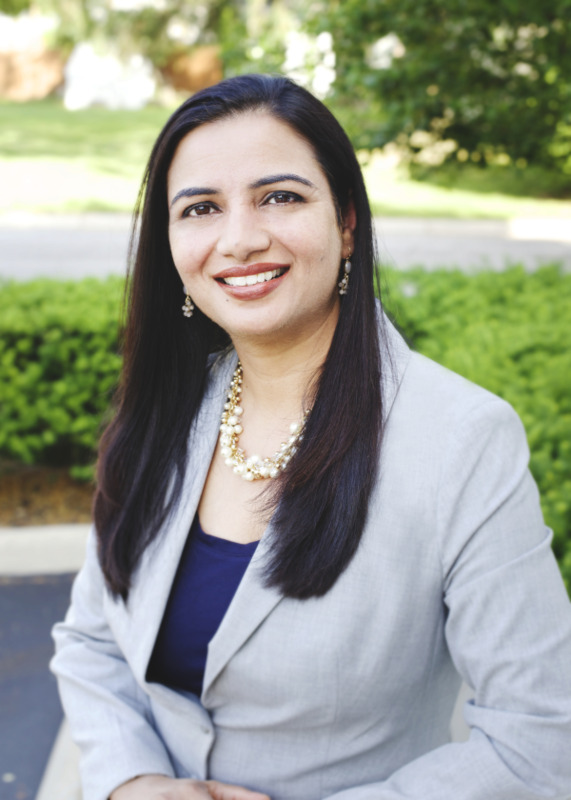 Dr. Sharma maintains a level of dental excellence through extensive continuing education and her active membership in various professional organizations including American College of Prosthodontics, American Dental Association, Carl O Boucher Prosthodontic Society, Ohio Dental Association, and Columbus Dental Society. Dr. Sharma has received various awards for her services in the field of dentistry and patient care. She is a recipient of “Spectrum Award”, “Excellence in Patient Satisfaction”, “Peer Review” and “Women of Distinction” award. She has been voted as “America’s Top Dentist” for past consecutive 8 years. She has been actively involved in the community through “Leadership of Dublin” program, “Smile from Heart”, “ASHA-Ray of Hope” and other charity events. Outside of her professional activities, Dr. Sharma and her husband, Sorab is very much involved in raising their two daughters ages 14 and 11. They all enjoy biking, soccer, gardening and numerous other outdoor activities. Dr. Sharma has a younger brother and two younger sisters who are all MD in Internal Medicine. Dr. Sharma has owned private practices for 8 years. Providing the most advanced dental care in a comfortable and pleasant atmosphere are her priorities. She has 2 convenient locations: Hilliard Advanced Dentistry in Hilliard and East Main Dentistry in Reynoldsburg, Ohio. “Dentistry is my passion. I want to be liked and remembered by my work. My goal is to provide utmost patient comfort, highest quality of care and build long term relationships. Skill and compassion go hand in hand when providing exceptional patient care. As a dental professional, I stay up to date on the latest advancements in dentistry in order to provide the most current treatment options for my patients. As a doctor, I recognize that my patients are unique individuals who have placed a great deal of trust in me and my team. That is just one reason why I value each and every patient relationship. I appreciate the time you’ve taken to visit this site and find out more about our dental practice, my team, and the many services we can provide to help you achieve optimum oral health. I take personal pride in providing gentle, high-quality, state-of-the-art dental care!